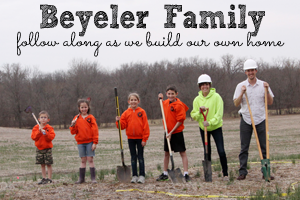 Building Beyeler Hollow: Day 300: Exterior lights, and MAJOR milestone! 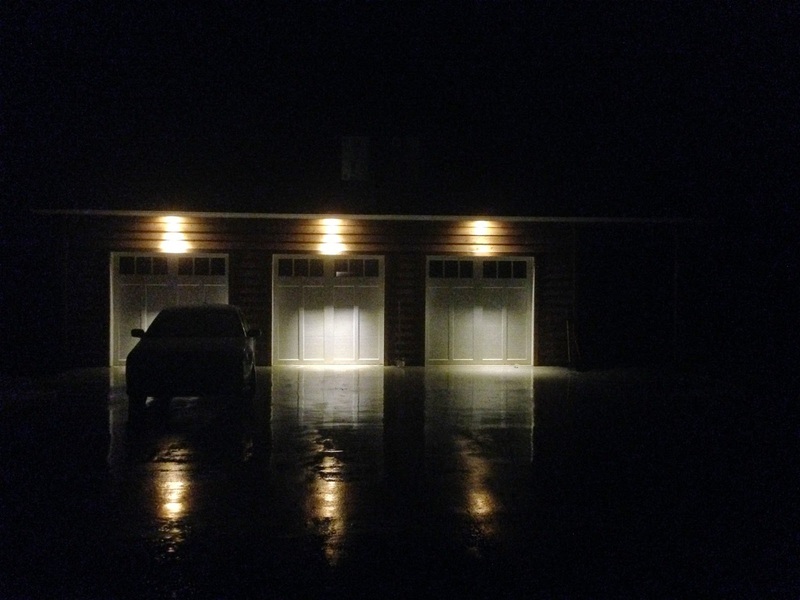 Day 300: Exterior lights, and MAJOR milestone! I just noticed that today is a huge milestone for us...Day 300 of the house build! Unfortunately, this is a milestone I never thought we'd hit, since I expected us to be done by now. Ah well, the more the merrier. We've made some good progress lately. Today I put in quite a bit of electrical trim out, i.e. outlets, switches, lights, etc. I finished the craft room, laundry room, closet, powder room, master bedroom and garage. I also put in three outside lights above the garage. They're wired to a dusk-to-dawn sensor, so they'll come on when it's dark and go off in the morning. They're LED and only draw 7W each. 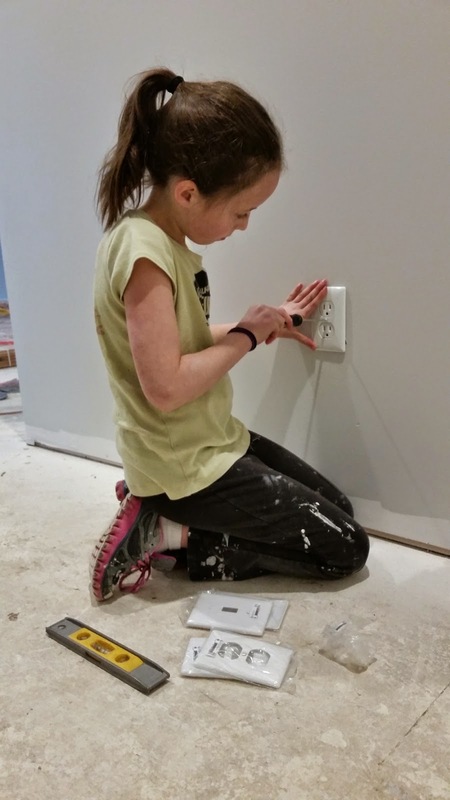 Abby was my electrical helper. I taught her how to put on plate covers using a screwdriver and a level, and she followed me along as I installed the devices. She eventually got faster, so that she was waiting on me to finish each time. 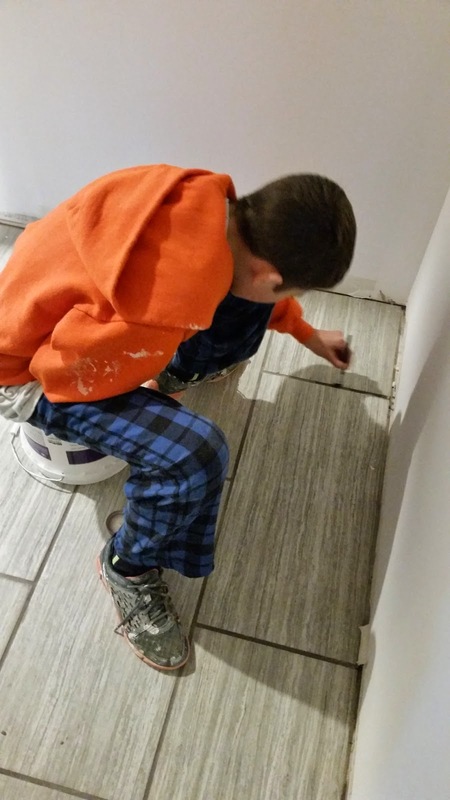 Reed finally found a job that he liked, and took to sealing our tile grout seams, painting on the sealer with a small brush and wiping off any excess. Emmy also helped with this endeavor. 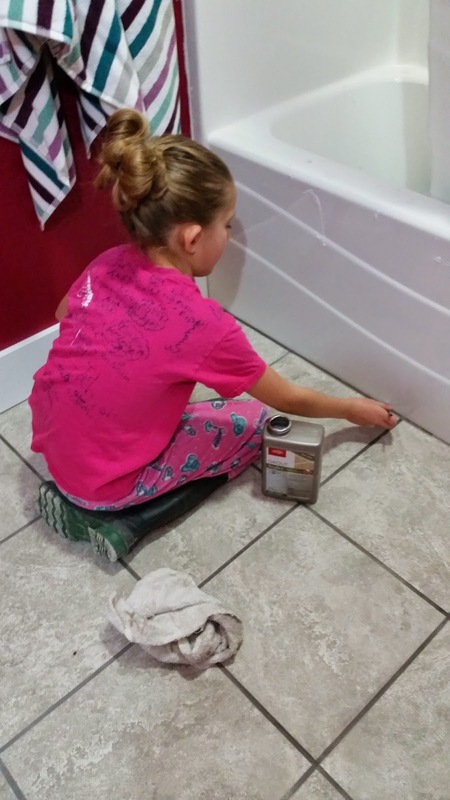 Emmy also cleaned all the drywall mud off the girls bathtub while I installed a toilet. Did someone say toilet? Yep, we have one now. Hello indoor plumbing. We got the new eco-friendly toilet that has two buttons on it: a small one for number one, and a big one for number two. The kids thought this was the funniest thing they had ever seen. Who know saving the planet could be so hilarious. This week we also more-or-less finished painting the interior walls and ceilings. Since we have a 26 ft vault (who's idea was that?) we had to be a bit creative. 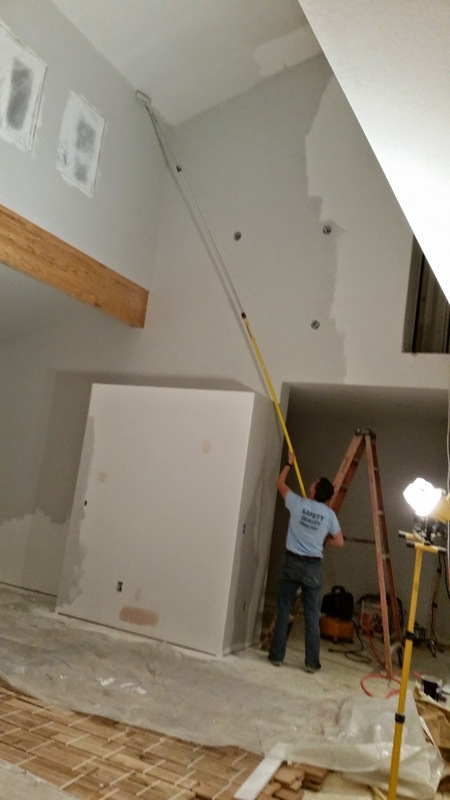 We opted for a long extension pole instead of scaffolding. I rolled the highest parts, because I'm so tall. Wednesday I took the day off to take advantage of our 70 degree weather and finish the ridge cap. I've been dreading this part of the project for some time now, since it involves being on a 12:12 (45 degree) pitch metal roof, which is a pretty fast and dangerous slide. 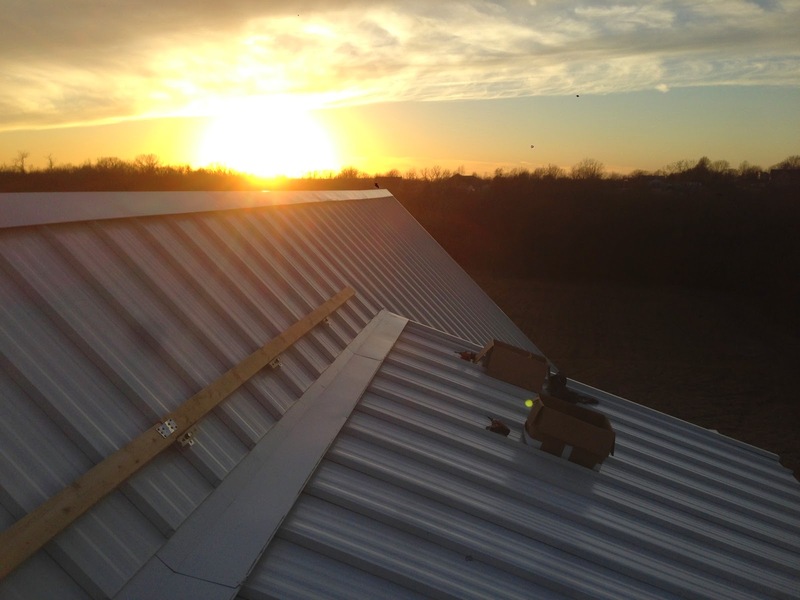 I ended up getting some S-5-S roof clamps to secure a 2x4 to the standing seam. I put in about 20 feet, and would then have to slide the clamps and 2x4's down, which was a precarious and time consuming feat. I thought it would take a day, but it took all day Wednesday, several hours Thursday evening, and another couple hours Friday evening. Steve helped, and I couldn't have finished it without his assistance. You know they make these ropes and harness things to secure you if you fall. 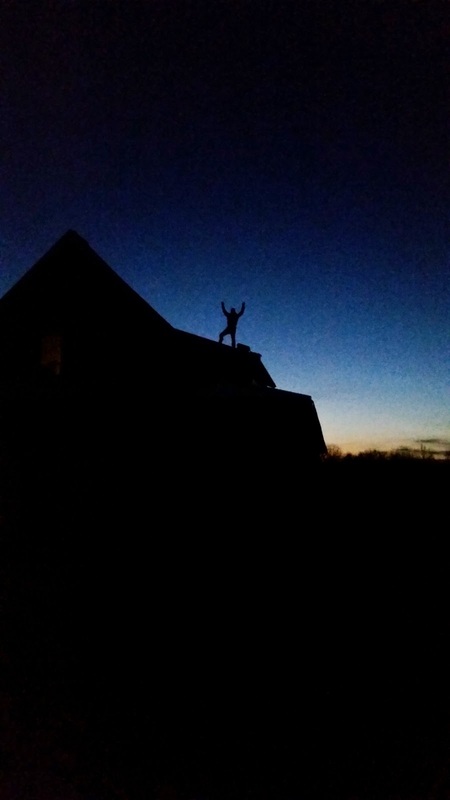 My dad even used them on the shed roof, of course he is 70... and still fell off the roof. But hes ok now. Mostly. Day 281: Let There Be Light! Day 275: Sheetrock is In!